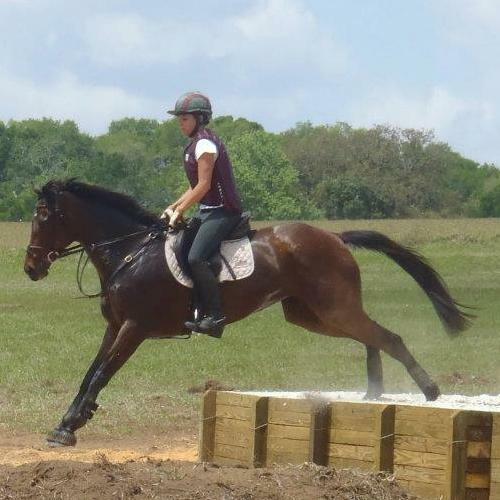 TROT~Thoroughbred Retirement of Tampa, Inc.
Click here for a complete list of the horses donated to our program. 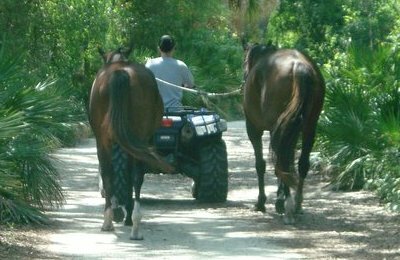 Thoroughbred Retirement of Tampa, Inc. is a 501(c)(3) nonprofit organization and all donations are tax deductible to the extent allowed by law. Please consult with your tax adviser. Click on the Pay Pal button below and enter in your donation amount. In the text box on the Pay Pal form, please indicate if you would prefer your donation to be earmarked for a specific item. You can use Pay Pal even if you don't have an account with Pay Pal. And it's SERCURE! You can also send a check directly to us. Below is our mailing address. We currently do not have any hands-on volunteer opportunities with the horses as they are boarded or fostered at private facilities. We have fundraisers at Tampa Bay Downs during the live racing meet and need help selling raffle tickets. All you need is a Smartphone with wifi or unlimited data and the ability to talk to complete strangers in order to sell tickets. We hold these events on Opening Day in November (usually the Saturday after Thanksgiving) and Kentucky Derby Day (the first Saturday in May) plus one or two other dates. If you would like to be kept informed on these fundraising events, please email us at info@tampatrot.org. Please contact us for other items you may have. 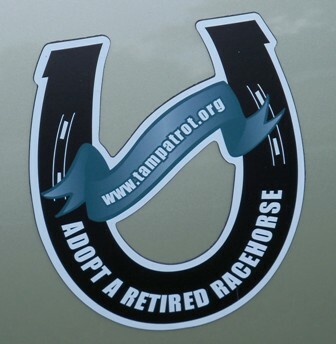 Order one or more of our car magnets and show your support for TROT and Thoroughbred aftercare! These 5" x 6" horseshoe-shaped magnets will look great on your car or truck. They are $10 each and the price includes shipping and handling. Simply place your order at our eBay store. All proceeds go toward the care of the horses in our program. Merchandise is also available at CafePress! AmazonSmile is a website operated by Amazon with the same products, prices, and shopping features as Amazon.com. The difference is that when you shop on AmazonSmile, the AmazonSmile Foundation will donate 0.5% of the purchase price of eligible products to the charitable organization of your choice (which we hope will be Thoroughbred Retirement of Tampa). If you love to shop on Amazon, this is a great way to let your purchases earn donations for us! When you list an item on eBay, you can designate a percentage of the sale price to Thoroughbred Retirement of Tampa. You can donate 10 to 100% of the proceeds. After the item sells, PayPal Giving Fund, eBay's nonprofit partner, collects your donated proceeds and eBay then credits your selling fees proportional to the amount donated. PayPal Giving Fund processes the donation and distributes it us. All donations are tax deductible, too. It's a win-win for everone! For more information, please see our eBay Giving Works page. 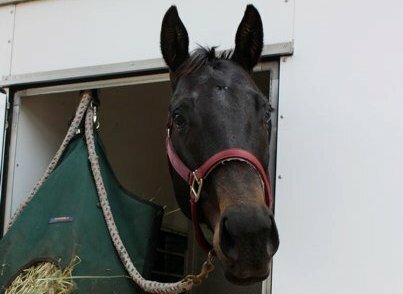 Join Goodsearch.com to raise funds for us (Thoroughbred Retirement of Tampa - TROT). Goodsearch donates money to our cause when you search the Internet or shop online! Use Goodsearch.com to search the Internet and they donate a penny per search to our cause. Use Goodshop.com when you shop online and the online vendors donate a percentage of every purchase and offer over 100,000 coupons to help you save money, too! It's really easy; it's free and turns simple everyday actions into a way to make the world a better place. Please sign up today to help us! Raise money for Thoroughbred Retirement of Tampa, Inc. when you shop online at iGive.com. Be sure to install the iGive button, too. Click here for detailed information on how this program works. 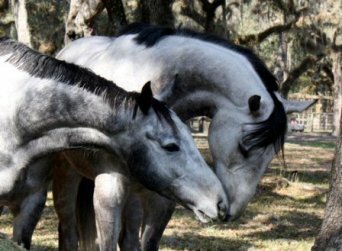 Click the banner below to find out more about how you can raise funds for Thoroughbred Retirement of Tampa, Inc. by recycling e-waste and purchasing quality remanufactured inkjet and toner cartridges. The recycling program is FREE so sign up as an Envirofriend today and start collecting e-waste! ©2019 Thoroughbred Retirement of Tampa, Inc.
A COPY OF THE OFFICIAL REGISTRATION AND FINANCIAL INFORMATION MAY BE OBTAINED FROM THE DIVISION OF CONSUMER SERVICES BY CALLING TOLL-FREE (800-435-7352) WITHIN THE STATE OF FLORIDA. REGISTRATION DOES NOT IMPLY ENDORSEMENT, APPROVAL OR RECOMMENDATION BY THE STATE.